What was Columbus like in the late 19th century? Look at the photograph to the left closely. 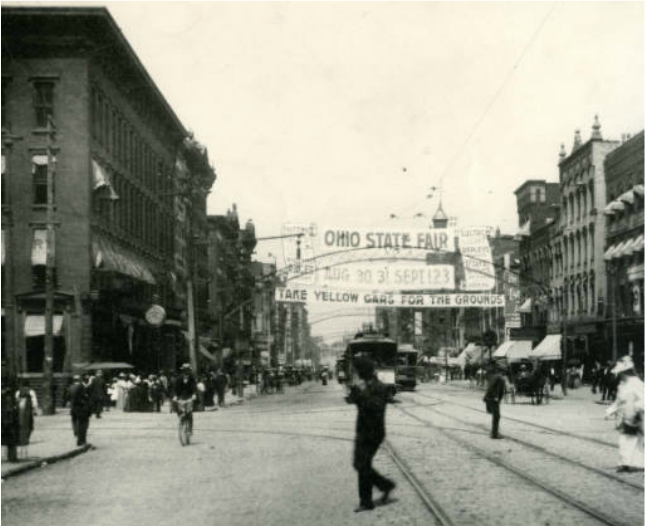 How many differences between Columbus in the late 1800s and Columbus today? Compare the buildings, businesses, fashion, transportation and anything else you can think of! 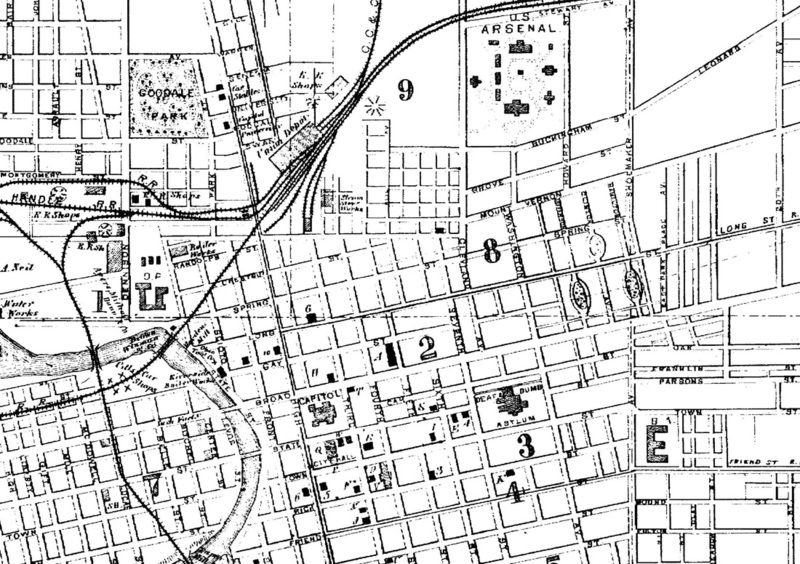 During the mid to late 1800s, Columbus was becoming a big city. It had business districts, grand government buildings, theatres, transportation systems, industry, and education. The population grew from about 18,500 in the 1860s to over 88,000 by the 1890s. New people were arriving daily - some came to Columbus to stay and others just traveled through Columbus on their way to destinations further west. Many came with the intent of staying only a short time, but found they liked it so much they put their roots down in Columbus! Columbus was at the center of major transportation routes. In the 1830s, Columbus was connected to the Ohio and Erie canal. During that same time, a section of the National Road was completed through Columbus. In 1850, the railroad came to Columbus, creating a huge demand for materials and labor. In addition to railroads, the streetcar became a popular way of traveling within the city. As you can see from the pictures, roads were often congested and muddy. People who lived in urban spaces, such as apartments, did not have room to house horses. Many people preferred to get around the city or commute to work using the streetcars. Streetcars originally were powered by horses, but eventually changed to electric. The second half of the 19th century saw Columbus grow into a center of learning, art, and industry. With so many people arriving in the city, there was a tremendous demand for building supplies, equipment, industry tools, clothes, and much more. The number of factories increased from almost 200 to 800 by the year 1900. Look at the photograph of a child above. The photograph was taken by the Keethler & Davie photography company. Photographs were developed and mounted on cabinet cards, which often had the advertising information of the photographer on the front and/or back of the card. What comparisons can you make between the way that professional pictures were taken then to how they are now? Anything else that you notice? 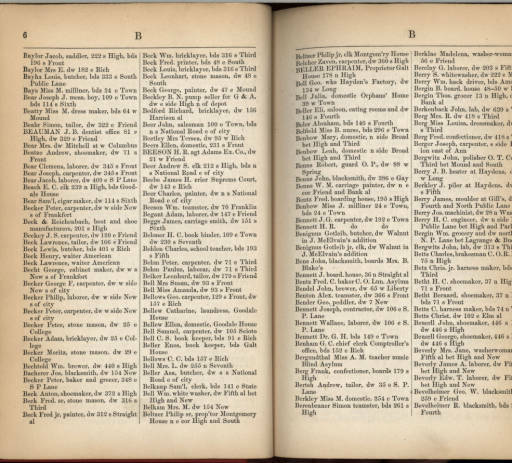 Click here to see a picture of actual pages from the directory! Columbus changed a great deal in size. From a tiny frontier settlement on the west side of the Scioto River in 1812 to a bustling, growing city in just a short 60 years, Columbus was, by 1872, emerging as an important industrial center, and a crossroads to a growing nation.